The median fee of an Australian Independent school. The number of students with disability (SWD) enrolled in Independent schools. SWD enrolments in Independent schools are increasing by 10% per year. 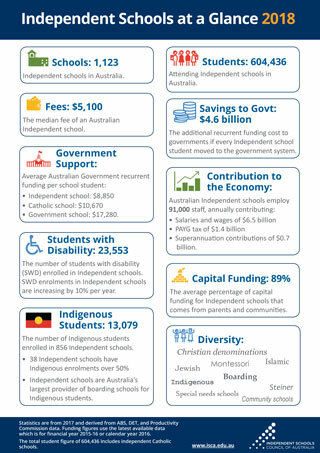 The number of Indigenous students enrolled in 856 Independent schools. Attending Independent schools in Australia. The additional recurrent funding cost to governments if every Independent school student moved to the government school system. Superannuation contributions of $656 million. The average percentage of capital funding for Independent schools that comes from parents and communities.